Lately Melanie has been talking about her "film bucket list" & so i thought i'd do mine. There really haven't been a lot of movies i wanted to see that i didn't get to (ones i did, include: The Last Days of Man on Earth (a "Jerry Cornelius" adaptation! ), Incubus (the infamous William Shatner-Esperanto project), Beyond the Valley of the Dolls (even more dreadful than i expected), & 'Tis Pity She's a Whore (a truly giallo treatment of the lurid Jacobean play), Satan in High Heels (Grayson Hall), Chimes at Midnight, & (most of all) Play It As It Lays); more like it's those i always meant to get around to, but still haven't. E.g. i adore Dreyer's Vampyr & The Passion of Joan of Arc, so why haven't i seen his other two (Day of Wrath; Ordet/The Word)? Or, there's probably just the one last Elizabeth Taylor movie i want to see--the unobtainable Raintree County. (Do i care about Reflections in a Golden Eye? Not that much.) One last Dominique Sanda: Beyond Good and Evil (she plays Lou Andreas-Salome!). One last Audrey Hepburn: Two for the Road. Another Paula Prentiss? I dunno...Is anything as good as Where the Boys Are or Man's Favorite Sport?. I think not. Number one would have to be: Berlin Alexanderplatz--supposedly Fassbinder's masterpiece. And number two, Freud, with Montgomery Clift as Sigmund himself. I only found it online once--& i was broke at the time. Wait--what about Atomic Submarine? The Bachelor Party (Carolyn Jones)...? Update 7/13: I have now seen The Host (nice), & discovered that both Skidoo & A Dandy in Aspic have since been released on DVD...(7/13 i've watched the latter one, now. And Freud--2014--if only on YouTube.) Truly we live in a wonderful time. Alpha Centauri Bb, a terrestrial-type planet of at least 1.13 Earth-masses in a 3.2357 day orbit around the K1 star of 0.934 solar masses, has just been discovered. I think i will call it Ravanastron. At 0.04 AU (my calculations give 0.041850045), the surface temperature is estimated to be 870 degrees Celsius--or, elsewhere, 1200-1500K. A veritable "lava world." (Curiously, there's already a petition to rename it "something more inspiring.") 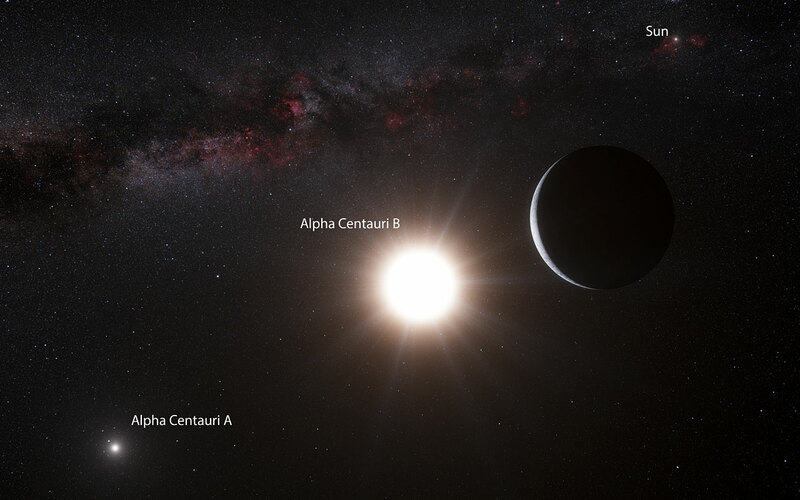 BTW, the orange star from Bb would appear 22 times larger than the Sun does from Earth. 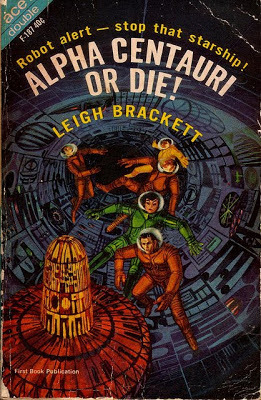 Science fiction has not neglected this star. 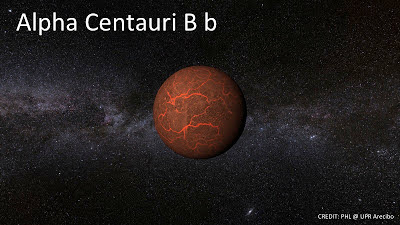 From time to time i look at it & dream, most recently as the planet Boaz... Perhaps the movie Avatar has defined it for the present generation, although for my money Alpha Centauri or Die! has got to be the most evocative title. Tangerine Dream did an album by that name, too. Meanwhile the old videogame is still remembered. 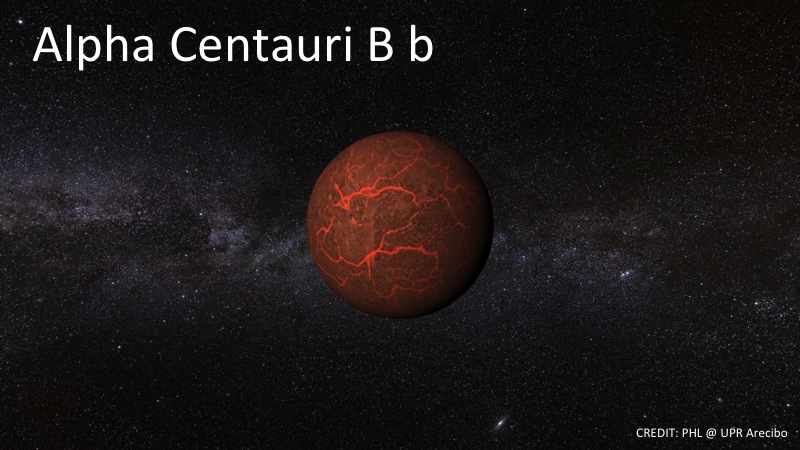 Reflections on Centauri B b. Also, melting points of some minerals for comparison.